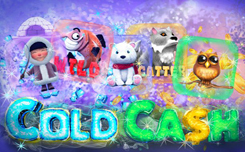 Cold Cash is a new slot from the company booming games. The new game has five reels and 20 game lines, and the fourth drum has a permanent symbol of Wild Reel, which increases the chances of the player to a solid win. You can also run the free spin function, which will bring 10 free spins. The game screen of the new cold cash slot is decorated in the form of a frozen cave. On the game drums there are thematic symbols: Eskimos, bears, owls, ice house – they all perfectly harmonize with the basic design. Symbol is a cartoon wolf who activates a bonus round, and a wild symbol is made in the form of a red fish. Playing a new cold cash slot, you will be pleasantly surprised that the fourth drum will have a constant wild value, that is, you will not see any other symbols on it, except for the least valuable scatter symbol. When the three scatter occurs, the bonus game is activated in the form of ten free spins, but with a feature different from the main game, where any combination that is collected will use the wild symbol, it will have a multiplier of x2. 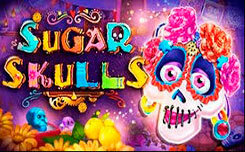 You can also get additional free spins by catching during the bonus round a minimum of three scatters.